An extremely disturbing trend is being witnessed in the world's largest democracy, India. Several media groups seem to have taken a cue from the Nazi propaganda style and have been targeting, demonising minorities, particularly, the Muslims. Not only they fan hatred and have normalized it, but many journalists are openly using social media to give a call for violence. This started a few years ago. Among major TV channels, Zee News, was among the first in Hindi while Times Now took the lead among English channels. Certain anchors were clearly inciting hate. No wonder, violence against Muslims in the name of cow protection, the lynching incidents, the attacks on Muslims, have all occurred in this period when media increasingly began behaving as a mouthpiece of hate brigade. After the last Parliamentary election, several other media groups, owners and editors too turned far-right. Open display of bigotry became the norm. A new English channel, Republic, joined the tirade. More Hindi and English news channels also started toeing the Hindutva line. There were some channels that were perceived as slightly less biased and more objective than others. However, there were certain anchors in these channels too who began peddling hate and lies. It was as if a competition begun as to who would outdo other anchors and other channels in spreading hate towards Muslims. India Today group that had a certain image and was believed to be practicing fair journalism, also began indulging in this propaganda. 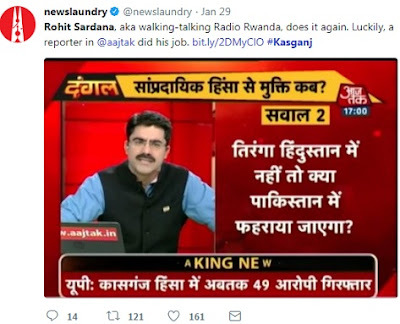 One of the anchors, Rohit Sardana, who has been brought from Zee group, has been the cheerleader of the extreme right-wing mob. 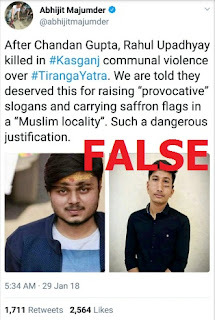 In the latest incident when Kasganj, a town in Uttar Pradesh, witnessed trouble on Republic Day, the TV channels were clearly involved in communal polarizing, spreading hate on the basis of rumours and not going by facts. Local Muslims had organised an event to celebrate Republic Day. The national flags were visible all around. Suddenly, 'Tiranga Yatra' arrived that had more Bhagwa (Saffron flags) than the national flags. There were also batons and firearms in their hands. Provocative slogans were raised on the occasion too. It was during this Yatra, that a youth, Chandan Gupta, had hit by a bullet. He later succumbed. However, TV channels gave it a twist as if minorities had any objection to unfurling national flag. Instead of questioning that who gave the Saffron forces the right to storm into any locality with Saffron flags, raise provocative slogans and rather than joining the Republic Day event, make abusive comments. The channels went ahead, they began speaking the language of the right-wing fanatics, giving a totally different impression. Just when curfew was on in Kasganj--there was violence, houses-shops were being attacked and burnt, these TV channels were busy in reinforcing the prejudices. Not just on TV, there were using other mediums [like Twitter] too for spreading hate. The aim was to polarize, communalize and foment trouble at a time when police and administration were trying to bring the situation under control. Another journalist, Abhijit Majumder who is a managing editor of Mail Today [also belongs to India Today group], tweeted about another death, though there was none. 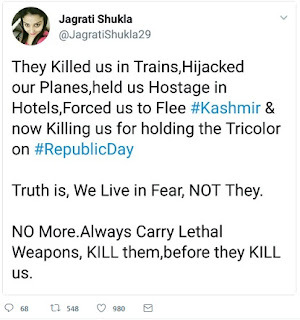 Then, there was Jagruti Shukla, who gave the open threat--her account was suspended by Twitter, but later suspension was revoked. As a result, the situation took such a turn than when a district magistrate R Vikkram Singh, wrote on Facebook about the trend of going to particular areas, raising slogans and disturbing law-and-order, he was trolled and targeted. Finally, he had to remove the post. 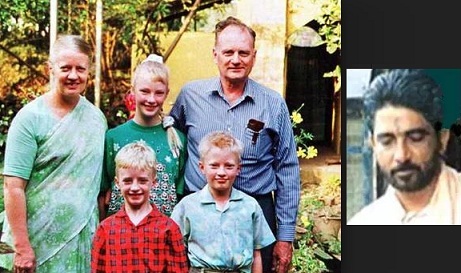 Graham Staines and his two sons were burnt to death in their car on this day--January 23, 1999. Though nineteen years have passed, it still evokes painful memories and remains a part of collective conscience of the nation. It serves reminder to us that how extremist ideologies can turn people into such monsters that they would even go to the extent of killing innocent children. Staines who hailed from Australia, had settled in India, and worked for leprosy patients. He was with his sons, Philip and Timothy, when an armed mob surrounded the vehicle and set it afire. The killings led to international outcry. 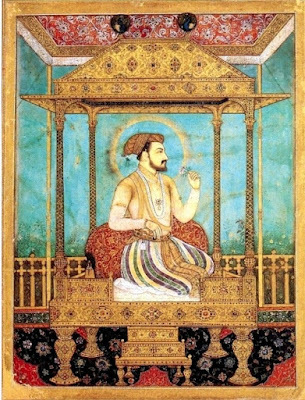 The man had dedicated himself to serve humanity and made India his home, yet, he was accused of luring locals towards Christianity. His wife Gladys rejected the charges that he converted people to Christianity. Dara Singh, who was associated with Bajrang Dal, was held guilty in this case. The trial court gave him death sentence. However, the High Court didn't consider it a rarest of rare case, and instead of capital punishment, he was given life term in the year 2005. The Supreme Court too upheld the decision, six years later. Despite the widespread outrage, right-wing forces have over the years continued to target Christians--either it is Dangs in Gujarat or attacks on Churches in Karnataka. Singh is in jail. Shockingly, despite Dara Singh's involvement in the monstrous act and his conviction for it, several websites that claim to be dedicated to the cause of Hindutva, express support to Dara Singh. When BJP government decided to do away with the Haj subsidy, there was not a single protest across India. Muslims didn't come out on streets. They didn't even burn effigies or stage any protests at all. It was peace all across India. Government took a unilateral decision but there was no opposition or street violence. 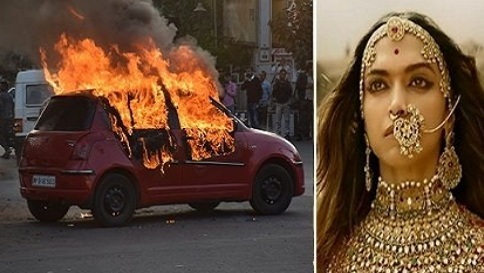 But, when a movie, Padmavati, was about to be released, the Karni Sena came out on streets, it threatened to kill actors, apart from threats to cut nose and bury the actors. Despite open threats, FIRs were not registered. The state, the media, everyone seemed to ignore the verbal threats and the violence on the streets, as if the Karni Sena is their own group and it was nothing but mere tantrums. Further, there were violent attacks, arson, attacks on cinema halls, assaults, threats to burn down theatres, even making an extremely shocking appeal to Rajputs within Army, and not even listening to Supreme Court. Just recall, mob violence in India in recent history. 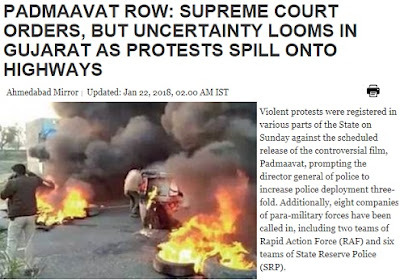 Army had to be called out in Haryana as well as in Gujarat during Jat agitation and Patidar movement. Is nationalism about burning-damaging national property? 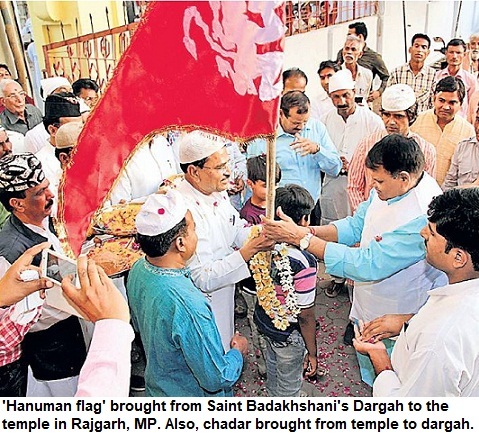 Bajrang Dal does it all the time but it remains national. Which Muslim group has been involved in such acts? None. Yet, the Karni Sena is termed as a 'fringe'. No extremism or fanaticism, used here. Similarly, when BJP government unilaterally decided to bring law banning Triple Talaq, the Muslim community, even if there were many voices against it, didn't go out on streets to stage protests or commit violence. This is not just about Karni Sena. 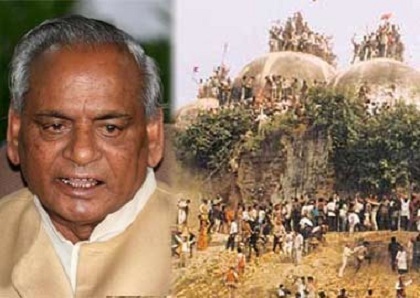 It is about Bajrang Dal and Ram Sene, it is about the VHP as well as HVK. 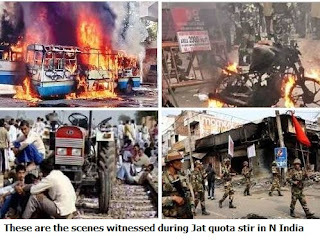 From Gujjar agitation to Jat violence, from Patidar movement to Baba Ram Rahim's followers--all have been incidents of organised violence, the state and law was defied, people died. Even in farmers' agitations or teachers' protests, one finds arson, attacks and violence. However, Muslims show maturity, despite bad press and constant demonisation, Muslims remain peaceful and avoid any mass protests or violence, don't damage national property and abide by law. This is the point, we must remember.